Aahh You are Such a Tease! Now that's a Retreat!! Bring on Nundle! Enjoy and have a drink for me. Enjoy all those vitamin Q!!!!!! 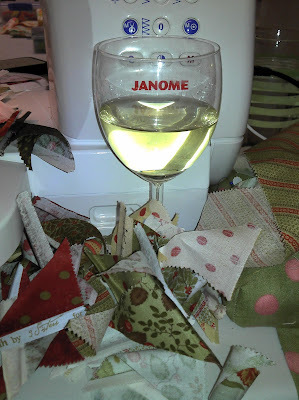 make sure you sew properly with all that wine drinking!!! Can you still sew straight?? yeah, see that is just being mean. wait till you are back home, and show us what a wonderful time you HAD. Now that's what I call a retreat. ENJOY!!!! Enjoy your retreat!! AHH!! are you meant to sew??? Lucky girl! Hope you have a wonderful time.....and a lot of quilting done! Cheers to you too...and congratulations on all the ribbons!! Fantastic! I'm off to Daylesford tomorrow for some craftiness myself. Hope you only had one! ;) I think I would have been asleep after one if I was there!! Are you sure LOL how's the jaw holding up. ahhh....looks like you are enjoying yourself! While I condone drink driving, its OK when there is < 1 horsepower, only one pedal and stippling is involved, in fact I think a glass is a necessity! Happy quilting Sue SA. Enjoy your retreat! And your wine! But be careful with the wine, we don't want any cut off fingers, crooked seams or cut off corners, do we? LOL! Have fun! ooooo....hope that Janome didn't drink too much!!!! Don't want it stitching where it shouldn't!!! tee hee! Amazing how you took that pic whilst collapsed under the table...go figure? Soooo jealous...I think I need a retreat of my own this weekend :) Is there much sewing getting done? Mmmmm the last time I tried combingin those two activities at the same time I fell off my chair LOL :) Barb.